ROTOR CLIP OFFERS “RINGS ON WIRE (ROW)” TO HELP ELIMINATE PACKAGING HEADACHES. 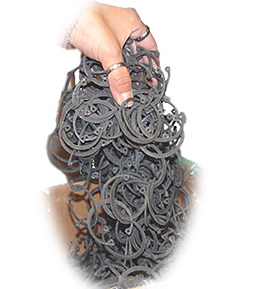 One of the most common types of retaining rings is the internal/housing ring typically used for bearing retention. This includes, but is not limited to, the HO, VHO, DHO and DHT series. 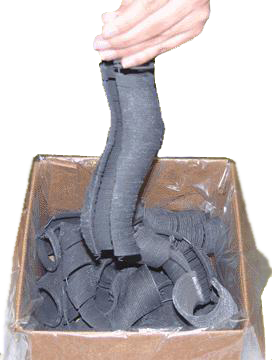 These rings are often difficult to handle due to their “open ended” configuration, which causes them to tangle when supplied loose bulk in a box (Fig. 1). Customers complained of difficulties in separating them for use in automated installation equipment or, in the case of distribution, in separating them into a standard packaging quantity that made sense for its customers. 1. Mixed parts are eliminated. 4. All parts are burr oriented. 5. Beveled parts will be properly oriented on the stack. 6. It yields a flatter part. It should be noted that when our production process includes ROW processing there is no additional charge for Rings-on-Wire packing option , and that ROW is standard packaging for many of our rings and constantly expanding. Please contact the factory for more details and if your rings can benefit from this packaging option.